Trump has been promising for more than two years to build a long, impenetrable wall along the border to stop illegal immigration, though Congress has been reluctant to provide the money he needs. In the meantime, he has repeatedly threatened to close the border, but this time, with a new surge of migrants heading north, he gave a definite timetable. The US and Mexico trade about $1.7 billion (Dh6.24 billion) in goods daily, according to the US Chamber of Commerce, which said closing the border would be “an unmitigated economic debacle” that would threaten 5 million American jobs. Short of a widespread shutdown, Nielsen said the US might close designated ports of entry to re-deploy staff to help process parents and children. 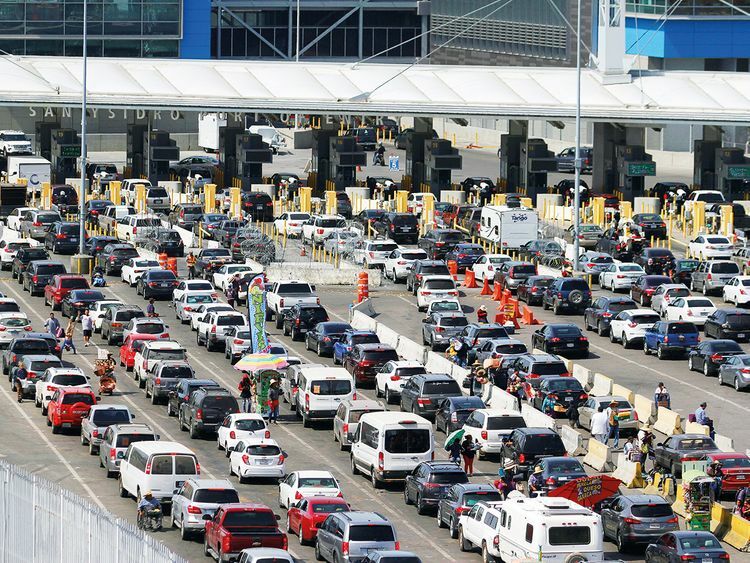 Ports of entry are official crossing points that are used by residents and commercial vehicles. The White House did not immediately respond to questions about whether Trump’s possible action would apply to air travel. Marcelo Ebrard, Mexico’s foreign relations secretary, tweeted that his country “doesn’t act based on threats” and is “the best neighbour” the US could have. Customs and Border Protection commissioner Kevin McAleenan said Wednesday that 750 border inspectors would be reassigned to deal with the growing number of migrant families. In Florida, Trump was also asked about the two migrant children who died in US custody in December. Is the administration equipped to handle sick children who are detained? “I think that it has been very well stated that we have done a fantastic job,” he said, defending Border Patrol efforts to help the children. Democratic and Republican lawmakers have fought over Trump’s contention that there is a “crisis” at the border, particularly amid his push for a border wall. He claims a wall would solve immigration problems, though it wouldn’t keep out families who cross at official points so they can surrender and be detained. The president called on Congress to immediately change what he said were weak US immigration laws, which he blamed on Democrats. The Department of Homeland Security wants the authority to detain families for longer and more quickly deport children from Central America who arrive at the border on their own. The department argues those policy changes would stop families from trying to enter the US.